Outline: Intro talks about walking in the light -- Christ's statement. Christ's purpose in dying for man. Whoever repents and trusts in Jesus is saved. What did Jesus Christ mean when He said, "He that follows me shall not walk in darkness, but shall have the light of life"? If we were able to follow the course of the sun in its path, we would always walk in the light of the sun, and we would never see darkness. We know that this is impossible. However, in spiritual things we can always walk in the light which has no ending, if we believe and follow Jesus Christ. "Follow the light" means repent from sin and leave all wickedness and follow the will of God. Darkness cannot stay along with light. So the man who follows God cannot walk in sin any more. During the time Jesus Christ lived in this world, never did He sin, or do anything to damage His fellowship with God. He came not only to teach God's truth to man, but to suffer agony for His sake. 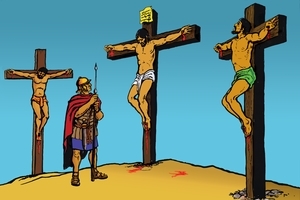 His purpose was to die to become a true sacrifice for sinful man. In the Gospel we are told that when Jesus Christ hung on the cross, the sun was veiled by God and darkness covered the whole land. While it was dark, Jesus Christ cried out in anguish, "My God, My God, why have you forsaken Me?" This word makes clear the agony of His soul, but what is the meaning of it? Why was Jesus forsaken by God, His Father, at the time of His distress? The answer is clearly given in the book of the Prophet Isaiah in this way: "All we like sheep have gone astray; we have turned every one to his own way; and the Lord has laid on Him the iniquity of us all." This means that on the cross, Jesus Christ carried all our sin. Because of our sin being laid on Jesus, God had to depart from Jesus, because God is holy and cannot be in the presence of sin. The darkness of the cross has passed, and Jesus Christ Who died for us has been raised from among the dead, so that the power of death can be broken for everyone who trusts in Him. Whoever repents from their sin and trusts in Him can be saved. Praise to God! Have you trusted in Him? Have you experienced His power in your life? Oh, trust in Him now. He is the Lord and Saviour of mankind.